But other cities have some good ideas too sometimes, and every so often we should glance around and see what might be worth stealing. We’ve made a good start with the recent announcement of a 300-kiosk bike-sharing system arriving by next summer, an idea we stole from Washington, DC, along with our new transportation chief Gabe Klein. But there’s a lot more we can rip off. There are areas where we haven’t been keeping up, or we’ve been making small plans, or we just haven’t taken the lead. Some of these ideas would cost money, but some of them would make money. Some of them might be immediately popular, while others could take some convincing. Some of them won’t happen—but some of them will. Walking around with an open container of alcohol is illegal almost everywhere in America. Even in lively areas full of nightlife and barhopping, you have to finish your drink before you leave the bar or abandon it half-full. Not so on Beale Street in downtown Memphis, the heart of the city’s main libations district. The section between Second Street and Fourth Street is exempt from the city’s and state’s open-container bans, so long as your open container isn’t made of glass. Bars will serve your booze in plastic cups, and if you feel like taking it outside it’s no more illegal than bringing a soda along with you. Establishments on the two-block section of Beale Street also get to keep serving until 5am if they want, later than the 3am limit in the rest of the city. 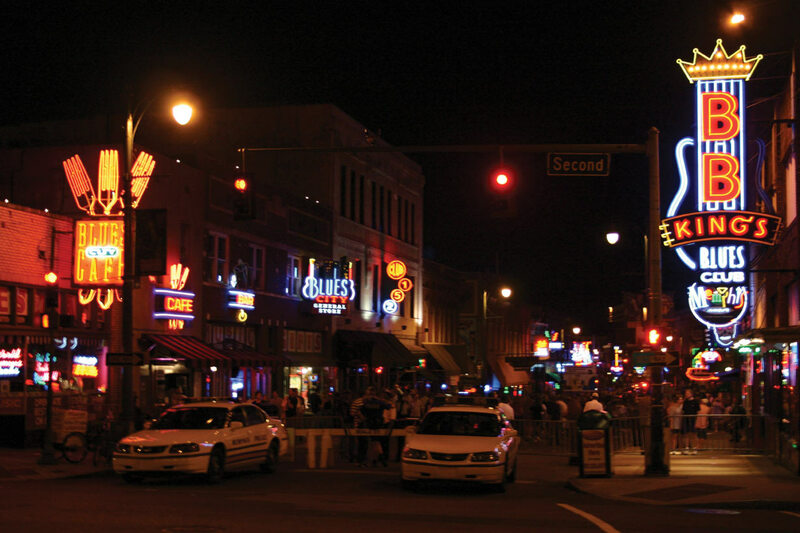 The loose alcohol regulations have helped Beale Street boom; the area had previously been rundown and boarded up after a disastrous round of urban renewal. Chicago already has plenty of lively entertainment districts, but allowing drinks outside and late into the night would only help bring in more tourists, more sales for bars, more tax revenue for the city, and more good times for everybody. Some might imagine increased street mayhem, but laws against violence and public intoxication will remain in force. In addition to banning open containers, Chicago law currently mandates that most bars stop serving at 2am, or 3am on Saturday nights; a “late hour” license, which is harder and more costly to get, lets them stay open two hours later. If they have a patio license, they can serve outdoors, but only until 11pm or midnight on Saturday nights—no exceptions. Imagine relaxing these rules on Clark Street in Wrigleyville; after a game, the street would turn into a group celebration (or commiseration), full of communal Cubs love and beer. Or imagine increased drinking opportunities on North Halsted in Boystown, with its bars spilling out onto the street, or South Halsted in Pilsen, with its galleries serving up wine in plastic cups during openings and Second Fridays. Most neighborhoods wouldn’t want the increased noise and crowds, but chances are anyone living along Clark or Halsted didn’t move there for the peace and quiet. Designating one spot as the city’s drinking district could be a win for everyone. In November 2008, voters in Los Angeles County approved a half-cent sales-tax hike to fund transportation improvements over the next thirty years, including twelve new or expanded subway and light-rail lines. But thirty years wasn’t fast enough for L.A. Mayor Antonio Villaraigosa, whose second and final term will end in 2013. In 2010, he announced an ambitious plan, the 30/10 Initiative, to cram those three decades of transit expansion into just one decade. Instead of using the thirty-year trickle of sales-tax revenue to fund design and construction bit by bit, he’d convince the federal government to float the city a long-term loan—a sudden gush of money, which the guaranteed trickle of profit from the transit program would pay back. The best part is, doing it faster means doing it cheaper, too: the total cost would be about $4 billion less because of avoided inflation. Since the Tea Party landslide in 2010, Congress has even less appetite for new spending, but through constant lobbying and multiple trips to DC, Villaraigosa has managed to win over some key legislators as well as Secretary of Transportation Ray LaHood. What Villaraigosa wants is a whole new type of federal funding program; if he succeeds, it’s one Chicago could benefit from too. 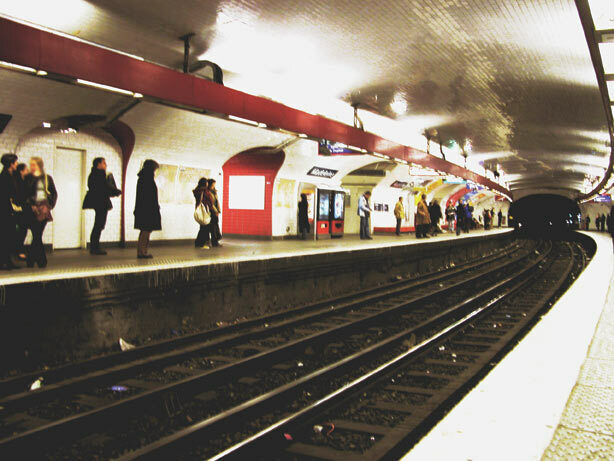 Just imagine—the Red Line extension, the new Circle Line, and a host of other improvements being finished off in Rahm’s third term, instead of his eighth. But if the Mayor wants to see that happen, he should step up and put his shoulder to the grindstone alongside Villaraigosa. What do you call a city that’s one big WiFi hotspot? A hotcity, would be one answer. “Minneapolis” would be another. The Twin City was part of a wave of more than 200 municipalities that announced plans for citywide wireless internet access in the mid-2000s. Some of them never materialized, and others functioned briefly before going defunct. Internet service provider EarthLink partnered with Chicago, San Francisco, Philadelphia and Houston amid great fanfare, but after a new CEO took over, it ended up firing half its staff and giving up on the municipal WiFi business. Some cities ended up with citywide networks restricted to government use, and others managed to wire up a few parks. Today, only a few places in the U.S. have true citywide public access: a handful of small towns, and Minneapolis. Unlike other major cities, Minneapolis rejected EarthLink’s bid and instead chose a local Minnesota company, US Internet, which is doing well and turning a profit. Minneapolis’ network came online in December 2009, and it covers all fifty-nine square miles of the city except a few lakes. The network isn’t free: subscriptions start at about $20 per month or $180 per year. But Minneapolis wireless subscribers can use the Internet anywhere within the city limits, and service in the suburbs may be coming soon. The city government also uses the network to coordinate everything from parking meters and garbage trucks to the fire and police departments. And the network is helping to bridge the digital divide: wireless is provided free at forty-four community centers, and US Internet uses some of its revenue to fund efforts to bring Internet service and computer training to low-income residents. After a couple of false starts, citywide wireless may be an idea whose time has finally come. Looking at Minneapolis, it’s not hard to imagine a future where Internet access is as accessible as air. Only about a third of America’s waste gets recycled or composted, according to the EPA, but in San Francisco it’s more than twice that. In October 2009, it became illegal to throw out organic waste. Now the city recovers seventy-seven percent of what it discards, the highest rate in America, and they’re hoping to reach one-hundred percent—“zero waste”—by 2020. Residents and businesses in San Francisco now sort their food and yard waste into green carts, recyclables into blue carts, and everything else into the traditional black carts. It’s a far more efficient and sustainable system than we have in Chicago, where the recovery rate is only forty-five percent. It would be quite a leap for Chicago, which still doesn’t have blue-cart recycling in every home, to add a green cart, especially in tough economic times. But San Francisco-style waste recovery isn’t necessarily more expensive, especially considering limited landfill capacity. The Illinois Environmental Protection Agency estimated last year that the Chicago area’s landfills have fourteen years’ worth of capacity left, and it’s a constant struggle (and expense) to expand them fast enough for us to fill them. In SF, fees are charged on a “pay as you throw” basis for garbage, but recycling and compost are free, creating a financial incentive for following the law and sorting your waste. In theory there are penalties for trashing what should be recycled or composted, but fines are low and come only after repeated warnings, if at all. You could say it’s a sort of carrot-and-stick system for disposing of carrots and sticks. Mayor Daley often said he wanted to make Chicago “the greenest city in America,” and his successor seems to agree. But it’s going to take quite a push to get our recovery rate anywhere near San Francisco’s, and in the meantime, the landfills will just keep filling up. The Kennedy Expressway cuts through the West Loop like a scar, dividing Union and Ogilvie Stations and the riverfront from Greektown and the new high-rise developments west of the highway. This moat-like effect, along with the destruction of the Maxwell Street neighborhood and the city fabric west of downtown, is the price we’ve paid to speed car traffic to and from the Loop. But it doesn’t have to stay this way forever. The construction of Interstate 5 carved a path of destruction through Seattle in the 1960s, and even before it was finished local officials and activists were thinking about how to repair the gash. Using a combination of city, county, state and federal money, they constructed a five-acre cap on top of the freeway near downtown Seattle and built a park on top. Freeway Park, completed in 1976, reconnected the downtown financial district with the First Hill neighborhood to the west, easing passage between the two and raising property values. The park-over-expressway concept has inspired a number of other cities to cover up highway trenches, and Seattle even had another go at it in the nineties, constructing Sam Smith Park over a section of I-90. Meanwhile, our own downtown stretch of I-90 would be a good candidate for a cap. There’s not much green space in the West Loop other than Union Park, a mile away, and the theoretical Kennedy Park (or whatever we’d call it) would be close to much of downtown. Right now visitors arriving by train step out of Union Station to find downtown two blocks to the east and a forbidding expressway barrier two blocks to the west; an expanse of landscaped greenery would help invite them over to the Greek restaurants stretching up and down Halsted. A roof would also protect the crucial high-traffic section of the expressway from the elements year-round. Of course, covering up a highway isn’t cheap. 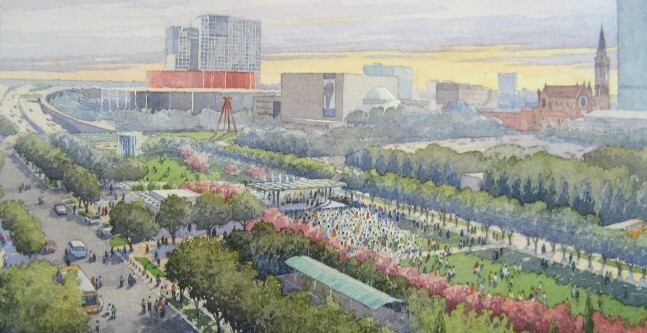 A park deck currently being built in Dallas over the Woodall Rodgers Freeway is costing $100 million in public and private funds, which comes out to about $500 per square foot. And that’s not even considering cost overruns of the sort that plagued Millennium Park and Boston’s Big Dig, the giant construction project that buried I-93 under a park but cost more than twice as much as predicted. But a number of cities—including St. Louis, Washington, Los Angeles, and San Diego—are looking into or planning highway caps and finding ways to squeeze money out of the federal government and private funders. Here Millennium Park offers a positive example: About $200 million of its total $475 million price tag came from private donations, including the sale of naming rights. Capping the Kennedy could be funded the same way, and the Canal/Congress Tax Increment Financing (TIF) district could be expanded to include the highway, just like the Central Loop TIF was expanded to include Millennium Park. Aside from the permanently higher tax revenue, the project’s legacy would be a beautiful new park space and a reconnected West Loop. And who can put a price on that? The Chicago River is a mess. Last May, it came in fourth on a list of the country’s most endangered waterways. The Environmental Protection Agency has threatened to impose stricter water-quality standards on the river if Illinois doesn’t shape up and do it first. The Metropolitan Water Reclamation District is being sued by environmental groups who claim it regularly violates the Clean Water Act. In the midst of all this, Mayor Emanuel announced in September that the city will spend $16 million to build four new boathouses on the troubled river. 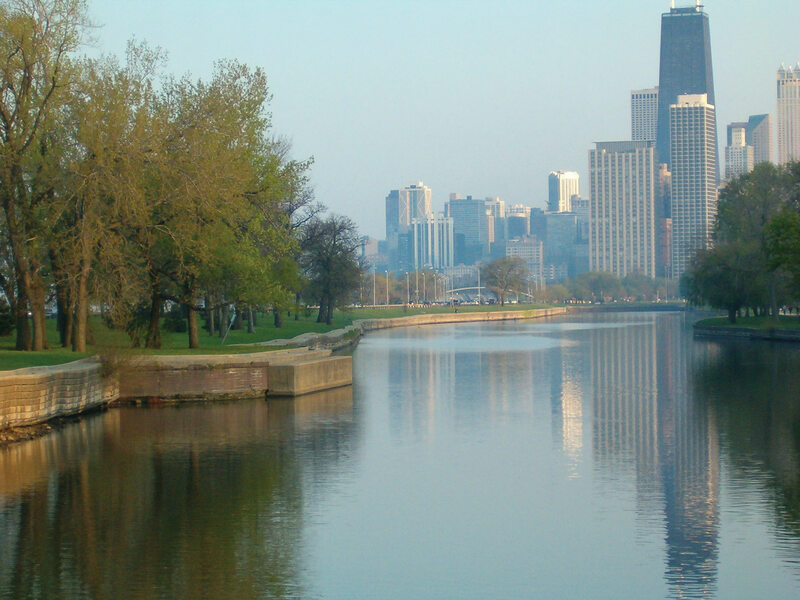 Unfortunately, Chicago isn’t alone in its river troubles, but we can learn from other cities with the same problems. In 2009, the Washington, DC city council unanimously passed a disposable bag tax. Starting in January 2010, all grocery stores, pharmacies and other food providers are required to charge a five-cent fee for each plastic or paper bag they dispense. The store keeps a bit of the revenue to cover administrative costs, and the rest goes to a newly established fund to clean up the city’s polluted Anacostia River, which is choked with—you guessed it—disposable bags. It’s an ingenious plan: either you skip the bag, thus keeping it out of the river, or you pay to clean other bags and assorted crud out of the river. So far it seems to be working. The tax raised $2 million in 2010, and according to one city estimate, the number of bags issued per month decreased from 22.5 million to only 3.3 million. One annual cleanup effort reported finding fifty percent fewer bags in the Anacostia in 2010 than the year before. In the past, disposable bags have filled the Chicago River too. “It’s lessened over the years as people have treated the river more respectfully,” says Margaret Frisbie, Executive Director of Friends of the Chicago River. But the bags are still a problem, and we don’t want them in the same water we use for recreation. Plastic bags take hundreds of years to decompose, and in the meantime they release carcinogens and toxic elements. Frisbie would welcome a tax to discourage them and bring in revenue. “I would recommend it go toward improved public access and storm water management,” she says. If we step up now, we might actually be able to use those boathouses by the time they’re built.